The market for writing is global, as is the need for solidarity of working writers. Writers from around the world compete for jobs and freelance assignments with publishers around the world. We market and distribute our writing to, and earn revenues from, readers around the world, indirectly (through publishers and licensing agreements) and directly (as self-publishers, especially in digital formats). The Internet is global. It isn’t called the “World Wide” Web for nothing. In the digital even more than in the print world, business activities and government policies anywhere in the world can affect our revenues – for better or worse – and impact our rights as writers. In a race to the bottom for writers’ rights, policies and practices in the USA (or any other country) that respect writers’ rights and help us earn a living from our writing can be undermined by policies and practices anywhere in the world where our adversaries – traditional publishers, Internet “platforms”, and opponents of copyright -– can find a “jurisdiction of convenience” to base their Web servers. In this environment, international engagement by the NWU is an essential element of our advocacy for writers’ rights and our defense of our livelihoods. Unlike some other organizations, the NWU’s structure includes neither an “advocacy director” nor a director of international affairs. At various times in the NWU’s history, this work has been done by the President, one or more of the Vice Presidents, other national officers, and/or other member volunteers. In recent years, the NWU’s domestic lobbying has been led by the Book Division Co-Chairs (and, until recently, by former Vice President Ann Hoffman), while I have carried out most of the NWU’s international work, as discussed below. In the last year, I have spent the equivalent of 3-4 months per year on unpaid volunteer work as an NWU member and officer, divided between work as Co-Chair of the Book Division; domestic advocacy and lobbying of the U.S. Copyright Office, Congress, etc. ; and the international solidarity and advocacy work discussed below. I do this volunteer work, in consultation with other NWU officers and members, because I believe that it serves both my own interests as a working writer and the interests of all working writers. To the best of my ability, I try to always keep in mind the tremendous diversity of genres, formats, media, and business models of NWU members and other working writers, in the USA and worldwide, and to advocate for policies that don’t leave some writers behind or sacrifice some writers’ interests to those of others. The cost of this work to the NWU has been limited to dues for membership in international federations, convention fees, and some travel expenses. These costs do not come out of member dues or affect our budget for overhead or member services. They and the rest of our expenses for advocacy work are paid for out of the much larger amount of earmarked money we receive through international licensing of works by U.S. writers. As a condition of receiving this money, we are required to spend it on work to advance the interests of all US writers, not just our members. 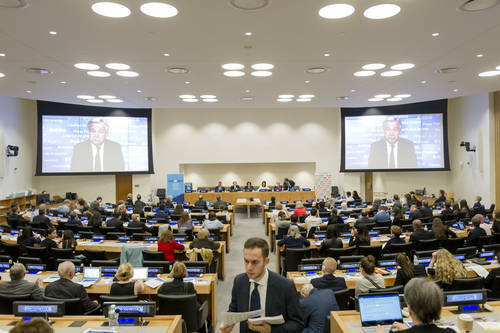 NGO observers to the United Nations, and provide boots-on-the-ground to assist IFJ in advancing the interests of journalists worldwide at U.N. headquarters in New York. The following report describes the three broad themes of this work: international solidarity; national and international laws and policies on copyright and writers’ rights; and international “collective licensing” of work by U.S. writers. Although some of our advocacy work involves confidential internal and coalition discussions of strategy, tactics, and negotiating and lobbying priorities, all of this work has been carried out within the framework of the NWU advocacy priorities ratified by the 2013 Delegate Assembly. Specific work in each of these areas has also been reported publicly through articles in our blog at NWU.org and to the NWU membership in the NWUsletter. The NWU is a member of three major international federations: the International Federation of Journalists (IFJ), the International Authors Forum (IAF), and the International Federation of Reproduction Rights Organizations (IFRRO). Based in Brussels, IFJ is a federation of national trade unions representing staff, freelance, and independent self-published journalists around the world. IFJ works to advance the economic interests of working journalists, administers the most widely recognized credentialing program for journalists (the NWU is the only organization in the U.S. authorized to issue IFJ press passes to freelance and independent journalists, a major benefit and incentive for NWU membership for these writers) and other services, and works to protect journalists who are attacked or threatened for their work: assassinated, assaulted, imprisoned, or retaliated against by the subjects of their reporting – a growing problem around the world as well as in the U.S. IFJ has embarked on a long-term campaign for an international treaty to project journalists – work in which the NWU can play an important role by helping represent the IFJ at the U.N. in New York. The benefits go both ways across the Atlantic. IFJ is based in Brussels, the capital of the European Union. IFJ has full-time European lobbying staff at its secretariat in Brussels and members throughout Europe who can lobby their national governments, and regularly sends representatives to meetings in Geneva of WIPO. Neither the NWU nor any other organization of U.S. writers has or could afford any full-time presence in Europe, and European legislators naturally pay much more attention to European voices than to those from the US or the rest of the world. Our membership and participation in IFJ lobbying gives us far better access to, and influence on, European and international copyright policy-making than we could have on our own or solely coming from the U.S.
As a result of my nomination by IFJ to the board of directors of IFRRO (discussed further below under “International Collective Licensing”), I’ve been invited to participate as an observer at quarterly meetings (by Skype in the middle of the night when I’m in the U.S., and in person when I’m already in Europe for IFRRO meetings) of IFJ’s “Authors Rights Expert Group” (AREG), which coordinates IFJ’s copyright lobbying. Although IFJ has members worldwide, and is seen as a lobbying voice for them, I’m the first and only non-European participant in AREG meetings. This has provided an important opportunity for trans-Atlantic dialogue about the different situations of journalists in different parts of the world, and for building understanding of the greater rights enjoyed by European journalists; the greater prevalence in the U.S. of digital formats, self-publishing, and independent journalism; and how copyright policy can best serve all journalists. The NWU is also a member of the International Authors Forum (IAF), a federation of national writers’ organizations. Like the NWU, the IAF represents writers in all genres, media, formats, and business models. IAF lobbies for writers with national governments and international organizations, especially WIPO (the World International Property Organization, the U.N.-affiliated organization that administers copyright treaties), and organizes international solidarity and support wherever writers’ rights are under attack. Most IAF meetings are held by conference call, but IAF also holds face-to-face meetings on the sidelines of IFRRO meetings. So our attendance at IFRRO meetings has given us a greater opportunity to be involved in IAF and to help make sure its lobbying (in which it speaks for writers worldwide) doesn’t leave out the interests of U.S. writers. As noted above, laws and policies in any jurisdiction in the world can affect the rights and revenues of writers in the US. Key areas for current lobbying include proposals at WIPO for new exceptions to current copyright treaties; copyright “reform” proposals under consideration by the European Union; and copyright laws and regulations in other countries, especially Canada and the UK as key markets for English-language writing. The greatest long-term international threat to writers’ rights and working writers’ livelihoods is pressure for new treaties, or amendments to existing treaties, to create new “exceptions” or “limitations” to copyright that would allow more copying and use of our work, especially for “educational” uses (which are a major market for many types of writing) without our permission and without payment. The Berne Convention treaty on copyright, to which the U.S. is a party, allows national governments to create exceptions to copyright only if they don’t “interfere with normal exploitation” of the work. This means that understanding the (new) norms of how writers exploit (i.e. generate revenue from) our written work is an essential prerequisite to assessing the legality of proposed exceptions. But new exceptions have been proposed, considered, and enacted without any consultation with writers or any awareness of how they would interfere with our new business models and revenue streams. Because the US has never implemented the copyright treaties it has signed and ratified, U.S. writers have fewer rights than writers in most other countries. The “fair use” exception to copyright in U.S. law is the widest in the world, and most writers around the world oppose the globalization of a U.S.-style “fair use” exception as a worst-case scenario. But there is pressure for new worldwide exceptions that would be even broader than the “fair use” allowed by U.S. law. Supporters of these proposals include academics and “public interest” advocates, some of them well-meaning but ignorant of how working writers earn our living. Many governments from the global South see copyright as benefiting only large Northern publishing corporations, and don’t understand how copyright supports individual writers. Internet companies don’t want to share their huge profits with the writers whose work they distribute and which generate those profits. Only through international alliances can we hope to oppose these efforts. The European Union is currently in the middle of a multi-year process of consideration of a proposed directive on “Copyright in the Digital Single Market”. This proposal is a complicated omnibus bill containing provisions supported by various interests. Some would be good for writers, some would be bad, and some would be good for some writers and bad for others. Some of the most controversial sections of the bill are relevant mainly to large publishers, and would have little effect on writers. It’s a fortunate coincidence that my term on the IFRRO Board, and the greater role it has given us within IFJ, coincide with consideration of this proposal by the EU. The NWU has been able to participate in development of lobbying strategy by IFJ and IFRRO, and stay informed on the EU legislative process through the IFJ and IFRRO secretariats. While in Brussels for IFRRO and IFJ meetings, I’ve been able to meet with key EU legislators, officials, and staff, and with the U.S. government’s European copyright lobbyists. None of these people has heard from or met with any other U.S. writers, and none of them had considered how the EU legislation might affect writers outside the EU. Without the involvement and initiative of the NWU, there would have been no consideration at all of the impact of the proposal on writers in the rest of the world. The NWU drafted, and got endorsements from several other organizations for, proposals for amendments that would mitigate the potential damage to U.S. and other non-European writers from some of the provisions in the proposed directive. To date, we’ve had no success in finding a sponsor for our amendments. Burt they have opened the door for consciousness-raising about how writers earn our living, and how that is different in the U.S. than in the EU, that wouldn’t have happened otherwise. The proposed EU directive remains under consideration. It’s unclear what its final provisions will be and how they will affect U.S. writers, or whether it may be defeated entirely (rare for EU legislation, but beginning to seem possible in this instance). Involvement with IFJ, IAF, and IFRRO keeps the NWU informed about laws in other countries that could affect the interests of U.S. writers. Typically, foreign writers are not consulted about national legislation (just as the U.S. Congress pays little attention to how U.S. laws affect foreigners). We have to take the initiative to speak up for ourselves. The most important international markets for most U.S. writers in English are, of course, Canada and the United Kingdom, and we pay special attention to developments in those countries. As discussed in the separate report to this 2018 NWU Delegate Assembly from the NWU Book Division, a major victory for the NWU this year was the withdrawal, after formal objections were filed with the UK government by the NWU, of an application for permission to establish an Extended Collective Licensing (ECL) scheme that would have allowed scanning and online distribution of U.S. works in UK libraries, without the knowledge or permission of the authors of these works or any way for them to “opt out”. Collective licensing makes a significant supplementary contribution to the incomes of some types of writers in some countries, and could make a greater contribution to the incomes of USA writers. It works like this: “reproduction rights organizations” (RROs) collect licensing fees for copying and other uses of written works, and distribute the revenues to writers, publishers, and/or “rightsholders”. RROs can license some kinds of copying and uses, such as photocopying in foreign countries, that it would be difficult or impossible for writers to license and collect fees for directly. And many readers prefer a “Netflix model” in which they pay a flat rate for access to a large body of books, articles, etc., from many writers and publishers, rather than a per-page or other pay-per-use fee. RROs can effectively manage, collect, and distribute money from these subscription schemes. Collective licensing is best for writers when it generates additional revenues from rights (such as photocopying in foreign countries) that writers aren’t otherwise exploiting. But writers are entitled to make their own business choices of how to offer their works to the public, and which distribution channels they think will be most profitable. If collective licensing schemes don’t respect the diversity of writers’ revenue streams, they can undermine (some) writers’ incomes by diverting readers from higher revenue distribution channels to lower-revenue ones, even while they benefit some other writers. Often, the devil is in the details of collective licensing schemes. To avoid the pitfall of sacrificing some writers’ incomes to others’, collective licensing needs to be (1) a free choice, to which writers opt in or from which they can easily and effective opt out if they want to exploit their rights in other ways; and (2) used only for rights that writers can’t readily exploit on their own (which can only be assessed if one understands how individual writers are exploiting their rights, including through digital self-publishing, online advertising, and other new business models). To be fair to writers, collective licensing must (3) ensure that writers receive their fair share of licensing revenues, rather than diverting all or an unfair share of revenues to publishers. Ensuring that collective licensing benefits all writers thus requires democratic control of RROs and participation by all affected categories of writers in designing licensing schemes. Most RROs are organized on a country-by-country basis, even when they license and collect revenues for works written and published around the world. But all major RROs around the world participate and coordinate their activities through the International Federation of Reproduction Rights Organizations (IFRRO), making IFRRO the only single organization through which U.S. writers (or any other group of writers) can try to get their interests and the ways they exploit their rights taken into consideration in the design of collective licensing schemes worldwide. There is only one representative of writers (and one representative of visual artists) on IFRRO’s Board of Directors. That representative has usually been from Europe, even though working conditions and revenue streams for writers are very different in Europe than they are in the US or some other parts of the world. As a result, there has been little understanding by IFRRO or its RRO members of how their activities affect non-European writers whose work is included in their licensing schemes. In 2016, as a result of relationships with IFJ’s international leadership forged by NWU President Larry Goldbetter, the NWU was invited to nominate a candidate for the author seat on IFRRO’s board of directors, and I was selected. I was elected by IFRRO members to a 3-year term on the board, from November 2016 through November 2019. IFRRO’s board of directors meets in person 3 times a year, most often one meeting at IFRRO headquarters in Brussels (in conjunction with meetings with EU copyright officials), one meeting in Geneva (in conjunction with meetings with WIPO copyright staff), and one meeting in conjunction with IFRRO’s annual world congress. More important than my role as an IFRRO director in making administrative and financial decisions for IFRRO is the opportunity that my seat at the board room table gives me for consciousness-raising and education. I try to raise awareness by IFRRO and its members – RROs, publishers, and writers from around the world – about the diversity of writers’ business models and how different writers, especially nontraditional writers, new-media writers, self-publishers, and writers in the U.S. and elsewhere outside Europe – are affected by the details of collective licensing schemes. Writers in particular, and workers in general, have fewer rights in the U.S. than in most European countries, and there is much less government support for literature and other types of writing in the U.S. than in most of Europe. As a result, the business models of U.S. writers often have more in common with those of our counterparts in the global South than with those of typical European writers, as has been apparent in discussions within IFJ. Perhaps for this reason, my candidacy for the IFRRO board as a U.S. writer was supported by the members of IFJ’s executive committee from Southern countries. Although IFRRO represents RROs – licensing organizations – it is often seen by governments as a proxy for the common interests of publishers and writers as well. My position on the IFRRO board helps me keep IFRRO from claiming to speak for writers. Participation in IFRRO and membership on the IFRRO board also give the NWU high-level access to IFRRO members, including publishers and their organizations, and to governments and international organizations (especially WIPO) that work with IFRRO. All of this work is technical, abstract, and long-term. But policy decisions that affect our interests and incomes as writers in the U.S. will be made by governments and licensing organizations around the world, whether or not we pay attention our make our views known. If we don’t speak for ourselves, or participate in alliances or federations that will represent us, nobody will do it for us. Through our international work, the NWU seeks to make sure that our members and other writers in the U.S. are beneficiaries, rather than victims, of globalization.